Appearance: Kiku stands at an even 5'5 and possesses a rather slim frame despite his love of pastries and cute cakes. His short, black hair is somehow both neat and choppy, and always seems oddly windswept. While Kiku's eyes were dark brown prior to his fall, they are now coloured dark red. Strangely enough, they have always been somewhat blank; smiling doesn't seem to warm them up in the least bit. Large black wings are folded neatly on his back and rarely ever spread to their full span – he finds them cumbersome while fighting, and sometimes wishes he could do away with them altogether. ...Though, that would also mean having to limit himself to human transportation, and Kiku isn’t quite ready to sink to their level. Kiku keeps his claws short, again to minimize any discomfort while wielding his weapon; he only uses them in combat as a last resort. He’s often seen wearing a black Japanese military uniform with red and gold accents; whether he wears the matching cap is entirely dependent on how windy it is. ...He’s very practical in that sense. 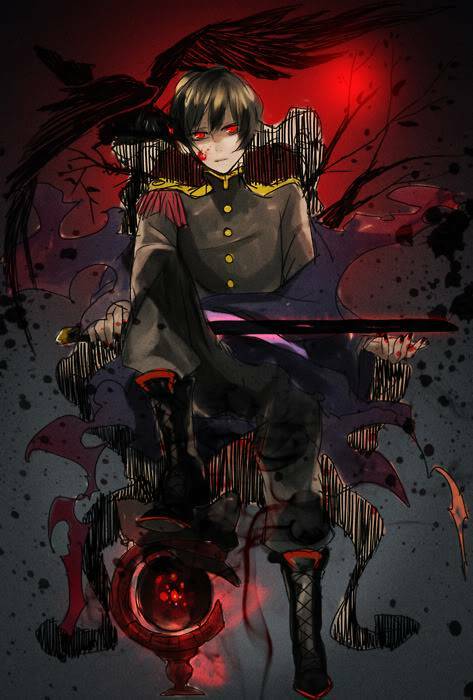 Kiku is never seen without his trusty katana, held in a black sheathe that seems to radiate with an unearthly aura. While posing as a human, he dresses much more casually (a certain young demon would say too casually) and his eyes return to their former dark brown colour. Personality: Despite being a demon, Kiku is rather quiet and soft spoken; he has a difficult time answering directly and skirts around the question by giving ambiguous statements. He also tends to keep to himself, becoming very nervous and shy when surrounded by unknown faces. Kiku has issues understanding and fully accepting things he is unfamiliar with (Western customs continue to baffle him), but he's still very intrigued by them. Despite his reclusiveness, Kiku has a soft spot for animals and cute things in general, especially if they're small. He's also a huge fan of anime and manga, as well as...salt. Kiku goes slightly insane if he is ever denied his salt. When faced with an opponent, angel, demon, or otherwise, Kiku's calm demeanor turns into that of a seasoned fighter; that katana he carries isn’t for display. He will stop at nothing to overtake his enemies, even if it means injuring himself in the process. Kiku is fiercely idealistic, and sees anything that challenges his views as a direct threat to his beliefs. Because of this, he rarely has any guilt regarding his more violent actions, believing that they will benefit both himself and his victims in the end. Strong willed and decidedly stubborn, Kiku is a formidable opponent to anyone brave (or crazy) enough to stand in the way of what he wants. History: Like all demons, Kiku began his existence as an angel; loyal, carefree, and brimming with optimism. Unlike most demons, Kiku did not fall during the Battle of Heaven. As a matter of fact, he was one of the most ferocious angels fighting on the side of God, sending many of his former brothers into Hell without the slightest regret. In his eyes, turning against the very entity that brought them to life was unforgivable; the traitors needed to be dealt with in the harshest and most permanent way possible. Regardless of his feelings during the Battle, the loss of so many angels left him shaken. As the years passed, Kiku grew paranoid, afraid of having to have a possible second uprising. The slightest disagreement would cause him to retract his statement almost immediately, while harbouring a newfound distaste for those who held different opinions than his own. Eventually, he grew distrustful of everyone around him, making a point to separate himself from others and holing himself up in his house for long periods of time. God was the only one he could really trust; all the other angels had the exact same capacity to betray Him as Lucifer. They would all wind up joining the Fallen, and he would be the only angel left to bask in God’s light. Kiku held onto his notion of superiority, unaware that the sin of Pride and Greed were already worming their way into his conscious. The angel’s punishment was dealt when he attempted to overthrow one of the reining Archangels, claiming he would do a better job of protecting Heaven from future attacks; all they seemed to care about nowadays were those inferior humans. Disappointed in Kiku’s selfishness, God forced the angel out of Heaven, sending him to join the other Fallen in Hell. At first, Kiku could hardly believe that he, of all people, had been cast down. After all, he was the only angel that was actually trying to prevent another uprising! His disbelief turned into resentment, and his undying love for God quickly became a thing of the past. Obviously, no one up there knew what they were doing, not even Him. It was Kiku’s responsibility to set things right; no one else had enough intelligence or power to do it. He set out to form alliances with the most powerful demons in Hell; those deemed worthy would join him in his rise against Heaven. The rest would remain in Hell to greet the new wave of angels cast from Heaven. Kiku has been glimpsed several times throughout the islands of Japan, providing the inspiration to several Japanese myths, from the tengu to the yuki onna (hey, it’s hard to tell in a blizzard). He visits Earth frequently, completely enamored by all the small ‘collectibles’ humans like to invent.